Le Hameau de Balestas is located in the “Balestas” area of Peyragudes ski resort where the views of the Louron valley are impressive. 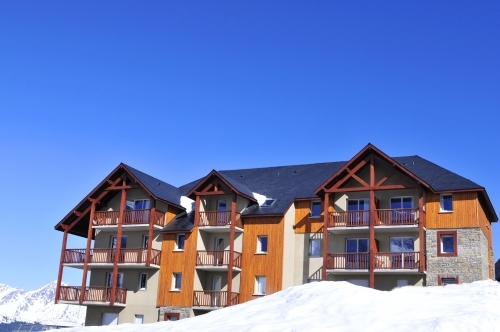 The ideal posistion of the accommodation makes it just 400m from the ski lifts and resort centre with its restaurants and bars. 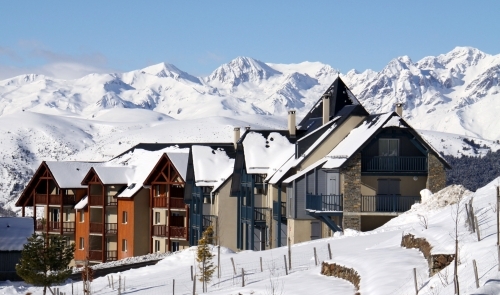 Le Hameau de Balestas is located on the Peyresourdes side of Peyragudes and offers individual chalets and apartments split over several buildings. 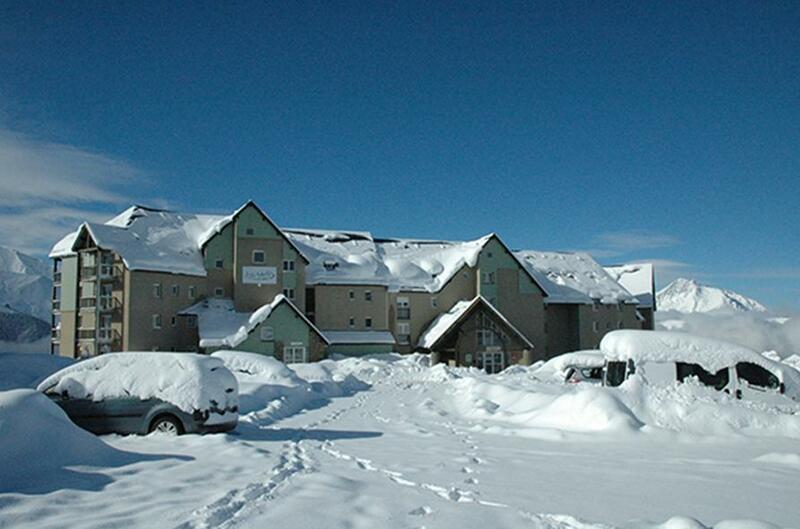 The ski lifts are 400m away and there is a free ski bus service to and from the residence. 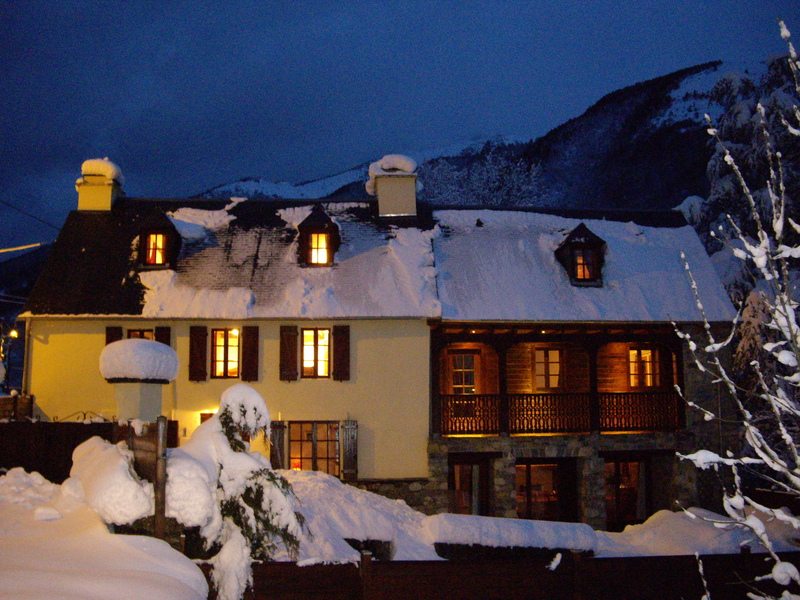 Built in typical Pyrenean style in light and dark woods with traditional stonework, Le Hameau de Balestas offers self-catering apartments and chalets and benefits from fantastic views of the Louron Valley. 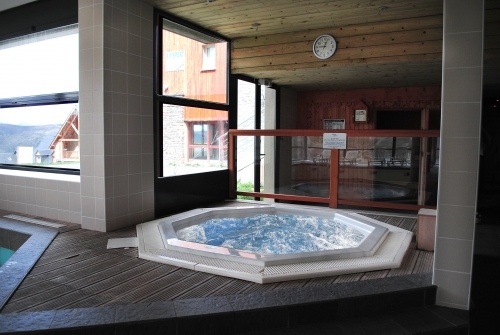 Facilities at Le Hameau de Balestas include free access to the indoor heated swimming pool with panoramic views, sauna & Jacuzzi, reception lounge area, ski lockers (free of charge), launderette (payable), on-site bakery and convenience store plus Wi-Fi internet access at reception (free) and in apartments/chalets (payable). The loan of highchairs, baby baths, bottles & changing mats (request at time of booking), board games, irons, ironing boards and raclette/fondue sets is also possible (all subject to availability). 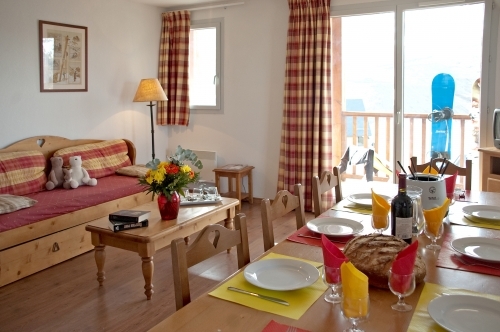 The self-catering apartments and chalets at Le Hameau de Balestas in Peyragudes are spacious, comfortable and fitted and furnished to a very good standard. The decor is modern, yet in-keeping with the traditional ski-apartment style and the use of light wood and warm tones give them a cosy atmosphere - just what you want after a day on the ski slopes. They all have a fully equipped kitchenette with ceramic hob, microwave, fridge, dishwasher, electric coffee-maker and a balcony. Studio sleeping 2 (ca. 25m2): Open plan living/dining area with 1 single sofa bed & 1 single pull-out bed, bath or shower room with WC. Balcony or terrace. Studio Alcove sleeping 4 (ca. 29m2): Open plan living/dining area with sofa bed (converts to 2 singles beds), 1 alcove with bunk beds & bath or shower room with WC. Balcony or terrace. 1 Bedroom Apartment sleeping 4 (ca. 32m2): Open plan living/dining area with sofa bed (converts to 2 singles beds), 1 double bedroom, bath or shower room with WC. Balcony or terrace. 1 Bedroom Alcove Apartment sleeping 6 (ca. 36m2): Open plan living/dining area with sofa bed (converts to 2 singles beds), 1 double bedroom , 1 alcove with bunk beds, bath or shower room with WC. Balcony or terrace. 2 Bedroom Alcove Apartment sleeping 6 (ca. 45m2): Open plan living/dining area with sofa bed (converts to 2 singles beds), 1 double bedroom and 1 twin bedroom, bath or shower room & separate WC. Balcony or terrace. 2 Bedroom Alcove Apartment sleeping 8 (ca. 55m2): Open plan living/dining with sofa bed (converts to 2 singles beds), 1 double bedroom and 1 twin bedroom, 1 alcove with bunk beds, 1 bathroom & separate WC. Balcony or terrace. 3 Bedroom Apartment sleeping 8 (ca. 60m2): Open plan living/dining with sofa bed (converts to 2 singles beds), 1 double bedroom and 1 twin bedroom, 1 bedroom with bunk beds, 1 bathroom & separate WC. Balcony or terrace. 3 Bedroom Alcove Apartment sleeping 10 (ca. 65m2): Open plan living/dining with sofa bed (converts to 2 singles beds), 1 double bedroom and 1 twin bedroom, 1 bedroom with bunk beds, , 1 alcove with bunk beds, 1 bathroom, 1 shower room & 2 separate WCs. Balcony or terrace. 4 Bedroom Apartment sleeping 10 (ca. 67m2): Open plan living/dining with sofa bed (converts to 2 singles beds), 2 double bedrooms and 2 twin bedrooms, 1 bathroom, 1 shower room & two separate WCs. Balcony or terrace. 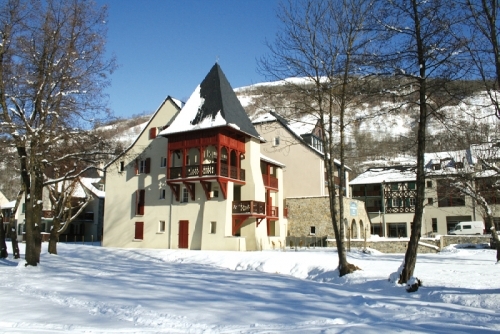 Chalet sleeping 10 (ca. 70m2): Ground Floor: Open plan living/dining with sofa bed (converts to 2 singles beds), Upper floor: 2 double bedrooms and 2 twin bedrooms, 1 shower room with WC, 1 bathroom & separate WC. Balcony or terrace. Please note: for any apartments/chalets at Le Hameau de Balestas in Peyragudes that feature bunk beds, sleeping in the top bunk is not recommended for children under 6 years old. 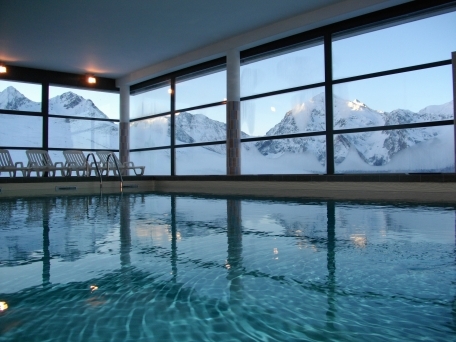 Fully equipped apartment/chalet, Wi-Fi internet access (in the main reception area only), ski lockers and free access to the indoor heated swimming pool, sauna and Jacuzzi. 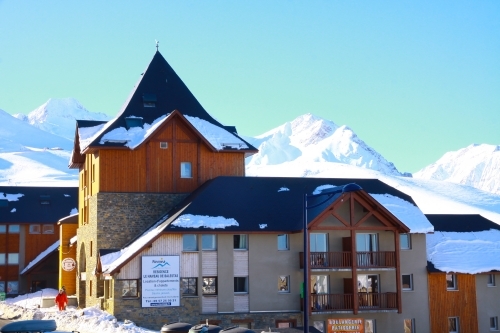 - Refundable breakage deposit: €260/apartment or €350/chalet and 3+ Bedroom Apartments (cash) - Please note no deposit, no keys! - Local Tourist Tax: from €1 to €2/person/day (guiding fare). 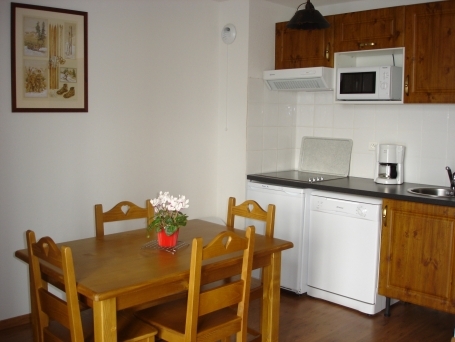 - End of stay cleaning (excluding kitchen area & dishes): €59/apartment & €100/from 2 Bedroom Alcove Apartment sleeping 8. - Daily cleaning service: on request (see reception for more details). - Hire of bed linen and towels: €17/person/change. - Hire of towels: €10/person/change – Hire of bed linen: €10/person/change. - Hire of TV: €42/week. - Hire of cot: €27/week. 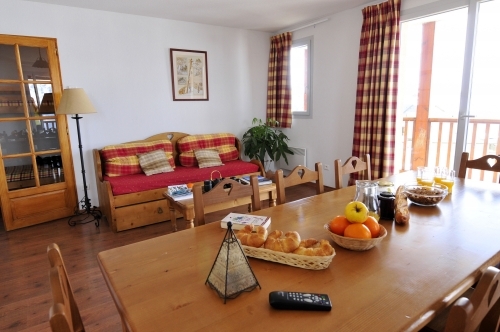 - Wi-Fi internet access in apartments/chalets: €16/week/connection. Only one pet per apartment is allowed and will be charged €38/stay (payable locally). A valid passport for your pet is compulsory. Highchairs, baby baths, bottles & changing mats (request at time of booking), board games, irons, ironing boards and raclette/fondue sets (all subject to availability). Closed Tuesday afternoon and Wednesday all day. Arrival day at Le Hameau De Balestas is Saturday (unless otherwise stated) 17:00 - 20:00 and Departure by 10:00.